I have been wanting to try Possets perfumes for quite sometime, but was always turned off by the website design and how many perfumes they offer. And it always bothers me when a perfume shop offers samples, but you have to write in your selections, and there's no list of all scents. It can make it very hard for the first time shopper to actually purchase. And I never did. I always wanted to, but was too overwhelmed. There is a wonderful lady however, who makes decanted samples for purchase, and you can pick if you want a sample, a half bottle, or a full bottle. You just make your selection on the Google form, and she invoices you once she's taken all the orders. Ajevie's Circles is a great way to try perfumes from shops you may not otherwise purchase from because of the limitations of their offerings. 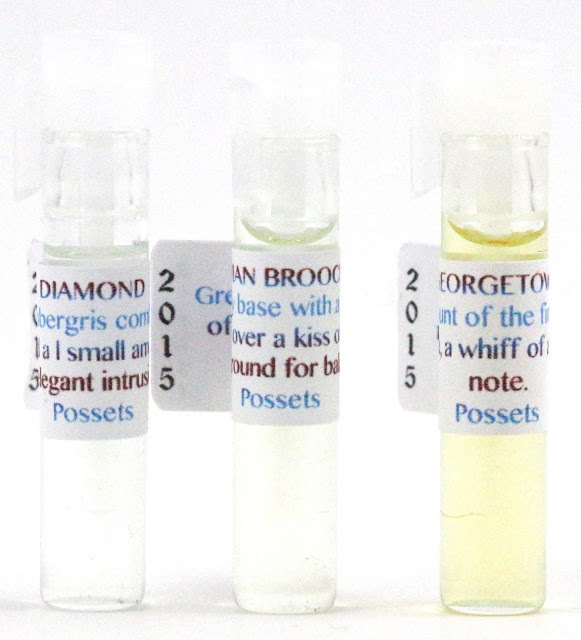 I was able to grab samples of almost every scent from the Possets Georgetown Cocktail Party collection for Spring 2015. Because I purchased decants from a third party, I do not have some of my normal review info. 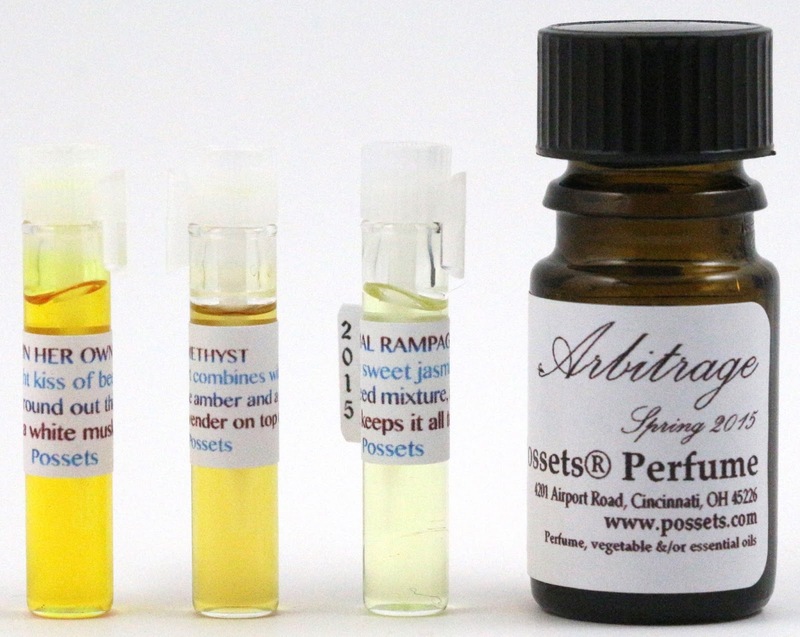 About - Possets is an indie perfumery shop, which offers a huge selection of scents. They are based in Ohio, and owned by Fabienne. Permanent collection scents can be purchased in sample form, but seasonal offerings are only available in full size bottles. 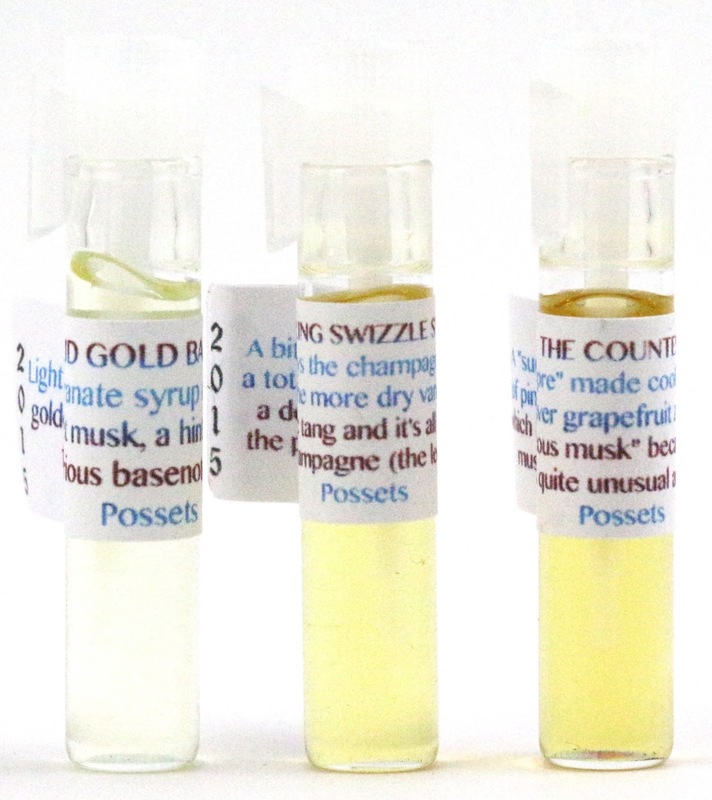 Ajevie's Circles is a great resource to procure samples of seasonal scents. Shipping - I am not sure how shipping goes from Possets itself, and not even completely sure how it goes from Ajevie's Circles as I combined this order with another that was after it. I will say I was ready for a wait, but it arrived quite a bit later than I had anticipated/readied myself for. I ordered this April 24th and combined it with another order from April 30th. It arrived June 3rd. Everything was perfect though. So expect to wait about a month for any decants you order from Ajevie's Circles. The other downside to this is that there wasn't much time to try these before having to make a decision if I wanted to purchase a full size bottle. I think in the future I will forego combining shipping and get them separately so I have more time to test and review. 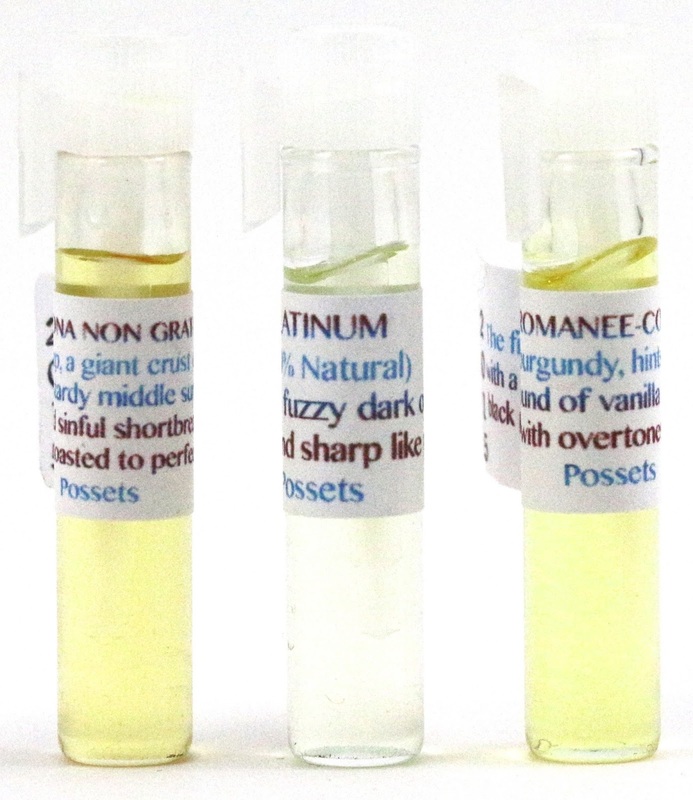 Product Size - Decant samples are in a 1ml vial. Half bottles come in the normal full size bottle, just filled halfway. And of course full size bottles come in their normal 5ml full size bottle. Free Samples - I do not know if Possets includes free samples with regular orders. I wanted to get a feel for what Possets has to offer, so I tried to get almost everything except for certain ones I had the feeling I just wouldn't like. And I only decided on one perfume as a half bottle instead of just a sample. A Lady In Her Own Right - "Neroli combined with a light kiss of beeswax, and sandalwood to round out things. A drop of myrtle, and a white musk backdrop." I sometimes find neroli notes to be very bitter to me, but this one actually smells florally, like it should. The other notes make it sweet and beautiful. It almost reminds me of jasmine, it has that ethereal sweet floral note that I enjoy. And it’s still soft and feminine enough to be worn just about anywhere. After a while, this scent really blooms, and I really enjoy it. Amethyst - "A sharp amber to start combines with a smoother and more caramel-like amber and a great shot of my fabulous lavender on top of it all." It’s very heavy with lavender and amber, so sharp it stings my nose. But eventually you do start to get the sweeter amber, and the lavender calms and soothes. I start to get mostly amber after a while, which I don’t mind, I like amber notes. It’s warm and cozy, but I do wish the lavender had more staying power. Animal Rampage - "Blue musk plays a savage dance with some very sweet jasmine which veers into the "dirty" category then comes back massively sensual. A hint of anise recalls a seed mixture, and a bed of black musk keeps it all together." I figured this was either going to smell amazing or terrible, but I think I like it. I was worried about the anise note, but the blue musk and jasmine really give it a nice floral feel. You can tell the anise is there, but it doesn't take away anything from the blend, instead it kind of grounds it. It's a wonderful jasmine scent, so if you like those like I do, I would recommend this one. Arbitrage - "Apricot, and smoky Tahitian Vanilla (aged to perfection). A very small amount of black tea, and an edge of mahogany essence." I thought that by the notes this would be one I would enjoy enough to get a half bottle of it. But it's not at all what I expected, instead of being light and fruity, it's heavy and dark. I get the tea and the woodsy mahogany. The vanilla is very smoky, not sweet at all. To be frank, I hate it. It's way more smoky than I anticipated, and I can't smell the apricot in the least. I'm going to keep it for a little while to see if it ages better, but if it doesn't I may need to destash it. I can't see myself wearing this in it's current state. Diamond - "A man made ambergris combined with pink grapefruit and a l small amount of white musk and an elegant intrusion of saffron." This is a very soft grapefruit scent, and I don't really get any of the other notes. Just pure grapefruit. This is another that will be great for the summer, as I tend to gravitate towards scents like this for the hotter months. It's not too strong either, which is a plus since it doesn't really seem to have anything else to balance it out. Fijian Broach - "Green tart leafy base with a long squeeze of lime layers over a kiss of brass in the background for balance." I was a little worried about the lime in this, but it really accentuates the green notes. It makes it smell very fresh and green, and it's really balanced. Not a single note dominates the blend, but just leaves it smelling very crisp. Georgetown - "A small amount of the finest leather, a tiny bit of tea, a whiff of a basic chypre note." Wow the leather note in this is phenomenal, but combined with the other notes it gives me a medicinal feel. And the leather kind of disappears on dry down, which is a shame because it's my favorite part of this perfume. After a bit it does calm down, and isn't so medicinal. Lethal Cocktail - "Cucumber and a very woody vanilla go hand and hand with patchouli." I have never considered myself a fan of patchouli, but I don't hate it either. This smells wonderful. I don't really get cucumber, but there is a hint of freshness to this one. But it's mostly a dark vanilla and really good quality patchouli. It smells surprisingly good. I think if you're kind of on the fence about patchouli, this might win you over. Maharani of Kuch-Bahar - "The purest of classic thick patchouli, a good dose of blood orange from Sicily, a light brush of incense, thick dark tamarind from India." I don't think I've ever smelled blood orange as fresh as this note, and the incense and tamarind add an interesting edge to it. It's a bit fruity and tart, but it smells like something from another country. Quite interesting, just not something I'd want to smell like all the time. Mink Stole - "The essence of serious sugar, add in sticky sweet vanilla bean syrup, a drop of butterscotch." Van Gogh Desecrated for Charity has similar notes to this perfume, but they couldn't smell more dissimilar. This one is even sweeter, more like caramel, bubbly sugar, and butterscotch. It's got a bit of vanilla bean added in for good measure. Persona Non Grata - "A river of sugar syrup to start things off, a giant crust of thick toasted sugar covering a custardy middle surrounded by the most sugar infested sinful shortbread crust which was ever toasted to perfection." This is basically sugary shortbread captured in a bottle. It reminds me of a Haus of Gloi scent, but I am blanking on which one. It’s also got a bit of spice to it that I can’t place. Like clove or anise, but it’s not overpoweringly spicy. Just a hint. This seems out of place for spring though, it reminds me of fall or winter baking. Platinum - "Wet stone and a fuzzy dark olive green scent, strong and sharp like platinum." I think this might be the first time I have actually been disgusted by a perfume. This smells truly awful. It smells like something rotting or decaying. It's definitely strong and sharp, but not in a good way. Seriously, this actually makes me want to throw up, stay away from this scent. I'm going to immediately wash this off. Romanee-Conti - "The finest of burgundy, the richest of scents. Hints of pomegranate with a background of vanilla and oak, a drift of black pepper, with overtones of black currant." This smells like burgundy and black currants. It's quite fruity, but is balanced out by the vanilla and oak. Burgundy kind of smells like grapes to me, but this is a much higher quality than other burgundy scents I've smelled. It's nice, but a little too fruity for me. Solid Gold Bangles - "Light pomegranate syrup combined with a golden sweet musk, a hint of sandalwood for a serious basenote, and pear." I get mostly pear, but it’s also got the pomegranate. It’s quite sweet and fruity, but it’s not too strong. It’s probably way too fruity for my tastes, but it does smell good. Definitely a higher quality fruit perfume than many others I’ve smelled. It reminds me of a Bath and Body Works kind of scent, but like I said, much higher quality. Sterling Swizzle Stick - "A bitter amber plays the champagne role along with a tot of vanilla of the more dry variety, muhuhu adds a definite metallic tang and it's all finished off with the pink in pink champagne." This is not at all how I imagined this scent would smell, it's quite sweet but with a bit of metallic tang. It smells warm and I think I like it. I don't really get champagne from this, but it's definitely interesting. The Countess - "A 'summer chypre' made cooling by the addition of pink Indian River grapefruit zest and something which I call "igneous musk" because it is a stone-like musk." This is quite a lovely grapefruit scent, and it does smell cooling. It's not too strong, but is a great summer scent. It's not too tangy, nor too sweet. I really like it, with the musk in the background it grounds it and balances it out. The Seductive Jesuit - "Turkish coffee, caramel cream, lavender, a strong and sweet amber." I recently got to experience a lavender latte, and it tasted similar to how this smells. I never knew lavender and coffee were a good combination, but this smells sweet, bitter, and herbally. I love this one, if you like lavender or coffee scents, this is perfect. The sweet notes do dominate though, so be aware of that. After dry down, the bitterness of the coffee balances everything out. Tipsy - "Lime and strong rye, a bit of unsettling whiff of mint when someone left the door open to sober up all the merrymakers." This kind of smells like a mojito, or some kind of lime and mint alcoholic drink. It's quite nice though, mellow and balanced, and there's a kind of sweetness to it. I love the addition of rye to it, it really gives it a wonderful scent. Nothing really stands out as the main dominate note, it is just really well blended. Van Gogh Desecrated For Charity - "Honey, and plenty of it, on top of vanilla (in the gooiest of all manifestations, the Mexican persuasion) and a spot of an amazing amazing sugar musk." This one is very sugary sweet drizzled with honey and infused with vanilla. For some reason it does kind of smell like a mature floral scent, but I'm not sure why. I tend to test perfumes for reviews completely randomly, and this just so happened to be my very first Possets perfume, and they're interesting. 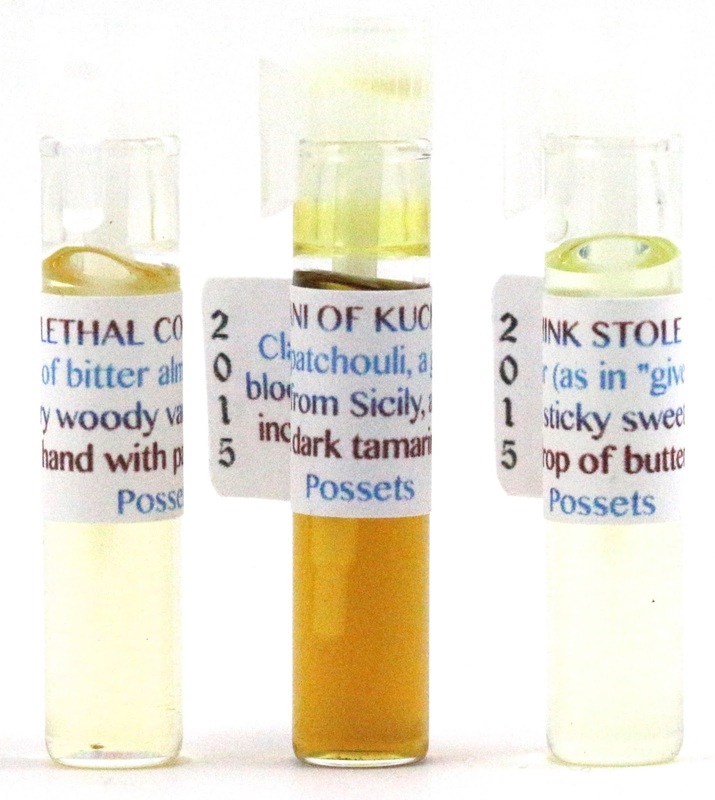 I get the sense that they're more like traditional perfumerie, but without the awful alcohol as a base. This one feels like it could be purchased in a fancy store, maybe in France. I know that sounds ridiculous, but I really do get the sense that Possets perfumes are classy, classic, and well crafted. 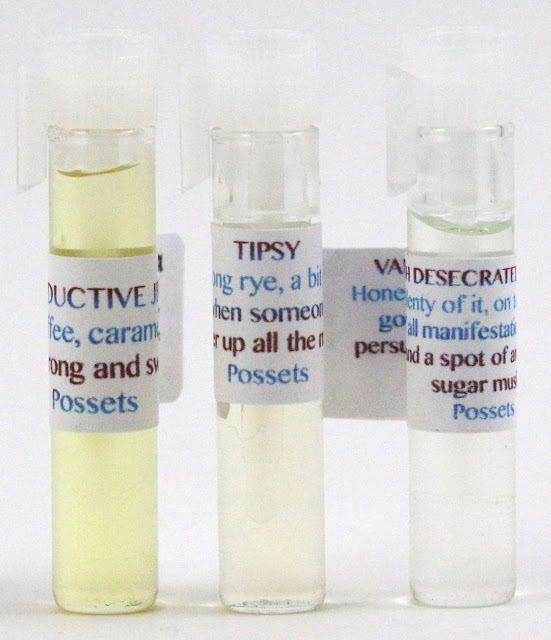 Overall, I really enjoyed my first Possets experience, all of the scents were extremely unique. I actually really liked the majority of these, which I was worried about. I wanted to get a bit of everything, even the ones I thought I wouldn't like, just to see. And I'd say it worked out well! My least favorites were the really fruity ones, but most of the ones I thought I might not like actually worked out. Some of my favorites include A Lady In Her Own Right, Animal Rampage, Sterling Swizzle Stick, The Countess, The Seductive Jesuit, Tipsy, and Van Gogh Desecrated For Charity. I'd say my first Possets foray went well! Customer Service - I did not have any problems with my decant circle order. Availability - These perfumes will be available until June 17th, when everything but Amethyst, Fijian Broach, and The Seductive Jesuit will be removed from the site. These three scents were voted into the permanent collection. Overall Satisfaction - My favorites were A Lady In Her Own Right, Animal Rampage, Sterling Swizzle Stick, The Countess, The Seductive Jesuit, Tipsy, and Van Gogh Desecrated For Charity. I surprisingly liked the majority of this collection, I will definitely be ordering decants from Possets again! What did you think of the Possets Georgetown Cocktail Party Collection? Let me know in the comments! Next time we hang out you need to let me smell the patchouli ones, I've been looking for a new patchouli scent for ages!